Just like other species of the hedgehog, the South African Hedgehog has a spiny coat with as many as 5,000 quills. When a hedgehog senses danger, it erects the previously flat quills and makes a high-pitched screech in order to intimidate the attacker. The body, quills, and face are dark or reddish brown, and there are conspicuous white band across the forehead, cheeks, and through the shoulders. Each hedgehog has different coloring and, occasionally, even white hedgehogs are found. South African Hedgehogs have good hearing although their eyesight and sense of smell are not so keen. Being nocturnal, South African Hedgehogs sleep in bushes, rock crevices, dugout termite hills during the day, and searches for food from dusk. Although they are predominantly insectivorous and particularly love termites, they also eat a wide variety of food such as small reptiles, earthworms, slugs, and even bird eggs, seeds, leaves, and fallen fruits. The breeding season is from December to March, and a litter is usually from two to seven. They find a burrow abandoned by termites or a shallow depression in the ground, cover it with a thick mat of leaf debris and sticks, and raise their young here. When born, hoglets have a fluid saturated membrane covering their quills so as not to hurt the mother’s womb and birth canal. At about 36 hours after birth, very soft, hair-like quills become visible, but it takes a few days for them to harden. South African Hedgehogs live in southern Africa. They are found in grassland, open thornveld, and shrubs in an arid region, but not in deserts. Because of their adorable appearances, the demands for hedgehogs as a pet lead to poaching. Many are also killed by indigenous people for food. However, it is agricultural development that is considered to have caused a large decline in the number of this species. Despite its adorable appearance, the South African Hedgehog threatens the attacker by erecting its sharp quills on its back. 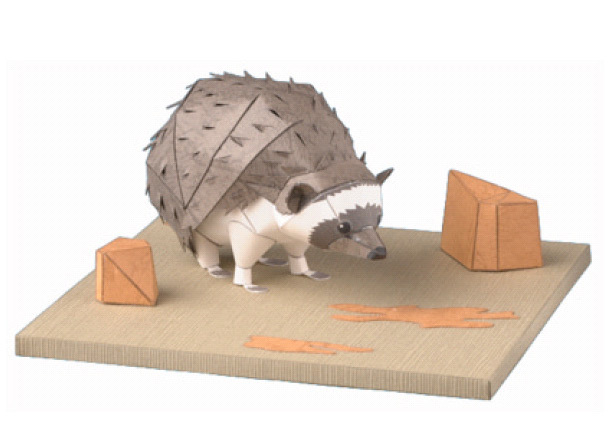 Assembly instructions for the Paper Craft Model of the South African Hedgehog covered with distinctive short quills, as well as a photo image of a completed model. The South African Hedgehog it is classified as “Vulnerable (VU)” in the Red List. Note: PDF data of each model was produced whenever it was carried on this page. If you have trouble with printing by the latest Adobe Reader, please try to use the Acrobat Reader ver. 5 which you can download from the Adobe website. + Photo Of Realistically Colored Paper Sculpture. + Uncolored Sculpture With Special Texture. + Assembly Instructions For The Paper Sculptures.